The Ark of the Covenant (Hebrew: ארון הברית,aron habrit) is a sacred chest in Jewish tradition that contained the stone tablets of the Ten Commandments, and at one time occupied the holiest shrine in the ancient Temple of Jerusalem. The Hebrew word aron is used in the Bible to designate any type of ark, chest or coffer, for any purpose (Genesis 50:26; 2 Kings 12:9, 10). However, the Ark of the Covenant is distinguished from all other arks by such titles as "Ark of God" (1 Samuel 3:3), "Ark of the Covenant" (Josh. 3:6; Hebrews 9:4), and "Ark of the Testimony" (Exodus 25:22). The Ark derived its significance and prominence from its content, the stone tablets, which symbolized God's covenant with Moses. According to Biblical tradition, the Ark of the Covenant was built in the wilderness of Sinai during the travels of the Hebrews to the Holy Land. Eventually, it was placed in the inner shrine in the Temple of Jerusalem. Both the Ark and its sanctuary were said to be "the beauty of Israel" (Lamentations 2:1), and Zion was consecrated because of its containing the Ark (2 Chronicles 8:11). Some Jewish Midrashim suggest that two Arks existed—a temporary one made by Moses and a later one made by Bezalel (Hertz 1936). In any case, the Ark of the Covenant disappeared (was hidden or destroyed) following the invasion of the Babylonians and their destruction of the first Temple of Jerusalem in 586 B.C.E. Many subsequent myths and legends arose about the Ark's potential whereabouts. 4 Where is it now? 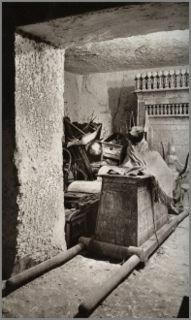 The Ark of the Covenant may have looked similar to this chest (found in the Tomb of Tutankhamun). The Bible describes the Ark as made of acacia wood. It was a cubit and a half broad and high and two cubits long (about 130 by 80 by 80 cm). The Ark was covered with gold. On each of the two sides were two gold rings, wherein were placed two wooden poles (with a decorative sheathing of gold), to be used to carry the Ark (Numbers 7:9; 10:21; 4:5,19, 20; 1 Kings 8:3, 6). Over the Ark, at each end, were two cherubim, with their faces turned toward one another (Leviticus 16:2; Num. 7:89). Their outspread wings over the top of the ark formed the throne of God, while the ark itself was his footstool (Ex. 25:10-22; 37:1-9). The Ark was deposited in the inner shrine of the Temple of Jerusalem (called the "Holy of Holies)," and was placed so that one end of the carrying poles touched the veil separating the two compartments of the tabernacle (1 Kings 8:8). When carried, the Ark was always wrapped in a veil, in badger skins, a blue cloth, and was carefully concealed, even from the eyes of the Levites (priests) who carried it. According to the Bible, the two tablets of stone containing the Ten Commandments (Deuteronomy 31:26) were kept within the Ark itself. A golden jar containing some of the manna from the Israelites' trek in the wilderness and the rod of Aaron that budded were also added to the contents of the Ark (Ex. 16:32-34; Heb. 9:4), but apparently were later removed at some point prior to the building of Solomon's temple, as the Tanakh states in 1 Kings 8:9 that there "was nothing in the ark save the two tables of stone." While Heb. 9:4 states these items were placed inside the ark, the verses at Ex. 16:33 and 34 and Nu. 17:10 use the expression "before" the Ark; some see a contradiction here as the correct meaning of these phrases is open to interpretation. A Rabbinic tradition states that Moses also put the fragments of the broken tablets of the Law into the Ark (Hertz 1936). Even Aaron, brother of Moses and the High Priest, was forbidden to enter the place of the Ark too often. He was enjoined to enter the Holy of Holies only once per year on a designated day, and to perform certain ceremonies there (Lev. 16). It is said that Moses was directed by God to consecrate the Ark, once completed, with the oil of holy ointment (Ex. 30:23-26); and he was also directed to have the Ark made by Bezaleel, son of Uri of the tribe of Judah, and by Aholiab, the son of Ahisamach of the tribe of Dan (Ex. 31:2-7). These instructions Moses carried out, calling upon "every wisehearted" one among the people to assist in the work (Ex. 35:10-12). Bezaleel, the artist, made the Ark (Ex. 37:1); and Moses approved the work, put the testimony in the Ark, and installed it. In Deut. 10:1-5, a different account of the making of the Ark is given. Moses is made to say that he constructed the Ark before going upon Mount Sinai to receive the second set of tablets. The charge of carrying the Ark and the rest of the holy implements was given to the family of Kohath (of the tribe of Levi). However, they were not to touch any of the holy things that were still uncovered by Aaron (Num. 4:2-15). When the Temple of Jerusalem was built, the Ark of the Covenant had been installed in the "Holy of Holies" located within the inner Tabernacle in the time of Moses. In the Book of Exodus, it is referred to as the most holy place (Ex. 26:34), and later as the holiest of all (Heb. 9:3). The Most Holy Place is said to be the place where the presence of God dwelt. The Most Holy Place was a place where the high priest would go in, once a year, on the Yom Kippur, to sprinkle the blood of an animal upon the Ark of the Covenant and the mercy seat which sat on top of the ark. The animal was sacrificed on the Brazen Altar and the blood was carried into the most holy place. It is said that the Lord would appear in the cloud upon the mercy seat, and at that time the priests should not enter into the tabernacle (Leviticus 16:2). The Ark is mentioned in one passage in the deuterocanonical book 2 Maccabees 2:4-10, which contains a reference to a document saying that the prophet Jeremiah, "being warned of God," took the Ark, and the tabernacle, and the altar of incense, and buried them in a cave on Mount Nebo (Deut 34:1), informing those of his followers who wished to find the place that it should remain unknown "until the time that God should gather His people again together, and receive them unto mercy." Hebrews 9:4 states that the Ark contained "the golden pot that had manna, and Aaron's rod that budded, and the tables of the covenant." Finally, in Revelation 11:19, the Ark is described as being in heaven, just before the woman clothed with the sun appears (Revelation 12). According to some Muslim scholars, the Ark of the Covenant does not have a religious basis in Islam and Islam does not give it any special significance, while others believe that it will be found by Madhi near the end of times. These Islamic scholars believe inside there will be relics left by the people of Moses and the people of Aaron. There might be the scepters of Moses (e.g., Nehushtan), Aaron's rod, Plates of the Torah, and Aaron's turban. In the march from Sinai, and at the crossing of the Jordan, the Ark preceded the people, and was the signal for their advance (Num. 10:33; Josh. 3:3, 6). According to tradition, the Ark of the Covenant burned the thorns and other obstructions in the wilderness roads. Sparks from between the two cherubim killed serpents and scorpions. (Canticles 3)  During the crossing of the Jordan, the river grew dry as soon as the feet of the priests carrying the Ark touched its waters; and remained so until the priests—with the Ark—left the river, after the people had passed over (Josh. 3:15-17; 4:10, 11, 18). As memorials, twelve stones were taken from the Jordan at the place where the priests had stood (Josh. 4:1-9). During the Hebrews' travels in the wilderness, the Mishkan was a "portable" Temple for the Ark of the Covenant. According to the Bible, during the journeys of the Israelites the Ark was carried by the priests in advance of the host (Num. 4:5, 6; 10:33-36; Psalms 68:1; 132:8). The Ark was borne by priests into the Jordan, which separated, opening a pathway for the whole of the host to pass over (Josh. 3:15, 16; 4:7, 10, 11, 17, 18). The Ark was also carried into battle, such as in the Midian war (Num. 31). 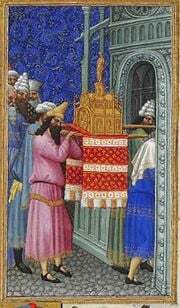 During the ceremonies preceding the capture of Jericho, the Ark was carried round the city in the daily procession, preceded by the armed men and by seven priests bearing seven trumpets of rams' horns (Josh. 6:6-15). After the defeat at Ai, Joshua lamented before the Ark (Josh. 7:6-9). When Joshua read the Law to the people between Mount Gerizim and Mount Ebal, they stood on each side of the Ark. The Ark was again set up by Joshua at Shiloh; but when the Israelites fought against Benjamin at Gibeah, they had the Ark with them, and consulted it after their defeat. The Ark is next spoken of as being in the tabernacle at Shiloh during Samuel's apprenticeship (1 Sam. 3:3). After the settlement of the Israelites in Canaan, the ark remained in the tabernacle at Gilgal for a season, then was removed to Shiloh until the time of Eli (Jeremiah 7:12), when it was carried into the field of battle, so as to secure, as they supposed, victory to the Hebrews; and it was taken by the Philistines (1 Sam. 4:3-11), who sent it back after retaining it seven months (1 Sam. 5:7, 8) because of the events said to have transpired. After their first defeat at Eben-ezer, the Israelites had the Ark brought from Shiloh, and welcomed its coming with great rejoicing. In the second battle, the Israelites were again defeated, and the Philistines captured the Ark (1 Sam. 4:3-5, 10, 11). A messenger at once took the news of its capture to Shiloh. The old priest, Eli, fell dead when he heard it; and his daughter-in-law, bearing a son at the time the news of the capture of the Ark was received, named him Ichabod—explained as "Where is glory?" in reference to the loss of the Ark (1 Sam. 4:12-22). The Philistines took the Ark to several places in their country, and at each place misfortune resulted to them (1 Sam. 5:1-6). At Ashdod it was placed in the temple of Dagon. The next morning Dagon was found bowed down before it. The people of Ashdod were smitten with boils; a plague of mice was sent over the land (1 Sam. 6:5). The affliction of boils was also visited upon the people of Gath and of Ekron, whither the Ark was successively removed (1 Sam. 5:8-12). After the Ark had been among them seven months, the Philistines, on the advice of their diviners, returned it to the Israelites, accompanying its return with an offering consisting of golden images of the boils and mice wherewith they had been afflicted. The Ark was set in the field of Joshua the Beth-shemite, and the Beth-shemites offered sacrifices and burnt offerings (1 Sam. 6:1-15). Out of curiosity the men of Beth-shemesh gazed at the Ark; and as a punishment over fifty thousand of them were smitten by the Lord (1 Sam. 6:19). The Beth-shemites sent to Kirjath-jearim, or Baal-Judah, to have the Ark removed (1 Sam. 6:21); and it was taken to the house of Abinadab, whose son Eleazar was sanctified to keep it. Kirjath-jearim was the abode of the Ark for 20 years. Under Saul, the Ark was with the army before he first met the Philistines, but the king was too impatient to consult it before engaging in battle. In 1 Chronicles 13:3, it is stated that the people were not accustomed to consult the Ark in the days of Saul. At the very beginning of his reign, David removed the Ark from Kirjath-jearim amid great rejoicing. On the way to Zion, Uzzah, one of the drivers of the cart whereon the Ark was carried, put out his hand to steady the Ark, and it is said was smitten by the Lord for touching it. David, in fear, carried the Ark aside into the house of Obed-edom the Gittite, instead of carrying it on to Zion, and here it stayed three months (2 Sam. 6:1-11; 1 Chron. 13:1-13). When Solomon dismissed Abiathar from the priesthood for having taken part in Adonijah's conspiracy against David, his life was spared because he had formerly borne the Ark (1 Kings 2:26). It was afterwards placed by Solomon in the temple (1 Kings 8:6-9). Solomon worshiped before the Ark after his dream in which the Lord promised him wisdom (1 Kings 3:15). In Solomon's Temple, a Holy of Holies was prepared to receive the Ark (1 Kings 6:19); and when the Temple was dedicated, the Ark—containing nothing but the two Mosaic tables of stone—was placed therein. When the priests emerged from the holy place after placing the Ark there, the Temple was filled with a cloud, "for the glory of the Lord had filled the house of the Lord" (1 Kings 8:10-11; 2 Chron. 5:13, 14). When the Babylonians destroyed Jerusalem and plundered the temple, the Ark entered the domain of legend. Many historians suppose that the ark was probably taken away by Nebuchadrezzar and destroyed. The absence of the Ark from the Second Temple was acknowledged. Typologically, the Ark appears in the New Testament as Mary, the mother of Jesus Christ. Like the Ark, Mary goes to Judea and remains for three months. Upon her return, Elizabeth asks, "How is it that the Mother of my Lord comes to me?" This is a repeat of David's "how is that the Ark of my Lord should come to me?" Finally, like David danced in the presence of the Ark, the baby John the Baptist (son of Elizabeth) dances in the presence of Mary. The "missing" Mishnaic text in the Mishnayot is called the Massakhet Keilim, written in twelve chapters. Each chapter of the Mishnayot describes vessels, which were hidden under the direction of Jeremiah the Prophet by five holy men (Shimor HaLevi, Chizkiah, Tzidkiyahu, Haggai the Prophet and Zechariah the Prophet), seven years prior to the destruction of Solomon's First Temple, because the dangers of Babylonian conquest were imminent. The Mishnayot describing this hiding was then written in Babylon during the Babylonian captivity. The first chapter of the Mishnayot describes the vessels that were hidden—including the Ark of the Covenant and the Tabernacle of the Lord, i.e. the Mishkan, the Tablets of Moses, the altar (with cherubim) for the daily and seasonal sacrifices (the ushebtis), the Menorah (candelabra), the Qalal (copper urn) containing the Ashes of the Red Heifer (ashes from a red cow sacrificed under Moses, necessary for ritual purification of the priests), and numerous vessels of the Kohanim (priests). The second chapter of the Mishnayot states that a list of these treasures was inscribed upon a copper tablet, which is potentially the Copper Scroll found at Qumran. The first of the Dead Sea Scrolls was discovered in 1947, and the famed Copper Scroll—made of pure copper—was found at Qumran in 1952. The Copper Scroll is an inventory, written in Hebrew, of treasures—thought by some to be from Solomon's First Temple, hidden before the destruction of that temple by the Babylonians and treasures which have not been seen since. The Copper Scroll states that a silver (or alabaster) chest, the vestments of the Cohen Gadol (Hebrew High Priest), gold and silver in great quantities, the Tabernacle of the Lord and many treasures were hidden in a desolate valley—40 stones deep under a hill—on its east side. Work in the 1990s showed that in 1896, almost one hundred years previous, Solomon Schechter at Cambridge University in England had acquired 100,000 pages of ancient Hebrew texts from the Genizah (repository for aged sacred Jewish texts) of the Ben Ezra Synagogue in Cairo, Egypt. A copy of the Tosefta (supplement to the Mishnah) was found in these texts, included among the text on Keilim (vessels). This Tosefta is the same text as cited by Rabbi Hertz as his source for the Mishnayot. There are many legends associated with the Ark of the Covenant, and scholarship has contributed to the growing body of literature and theories surrounding the Ark. Many individuals have claimed to locate or discovered the Ark but evidence of their claims is either dubious or inconclusive. In 1989, the late Ron Wyatt claimed to have broken into a chamber while digging underneath The Temple Mount. He claimed to have seen the ark and taken photographs. However, all photos came out blurry (leading to skepticism of the claim). According to Wyatt, the excavations were closed off (because of private property concerns) and, to the extent of knowledge, no one has seen the ark since. Ron Wyatt was widely seen in the Biblical archeology community as an attention seeker, often announcing that he had found Biblically important objects with little or no hard evidence to back up his claims. Vendyl Jones claimed to have found the entrance to the chamber in the Cave of the Column - Qumran. Here, he stated, is where the ark was hidden prior to the destruction of the First Temple. Arutz Sheva quoted Jones stating he would reveal the ark on Tisha B'Av (August 14, 2005), the anniversary of the destruction of both the First and Second Temples. However, this did not occur. On Jones' website he states that he was misquoted and actually said it would be appropriate if he discovered the ark on Tisha B'Av. Modern excavations near the Temple Mount in Jerusalem have found tunnels, but digging beneath the Temple Mount is somewhat restricted. It has been claimed that one of the most important Islamic shrines, the Dome of the Rock, sits in the location where the Temple Mount in Jerusalem once stood. Ron Wyatt said he felt it unwise to fully excavate the ark for a variety of reasons, including ownership disputes and divine inspiration. Some sources suggest that during the reign of King Manasseh (2 Chron. 33) the Ark was smuggled from the temple by way of the Well of Souls and taken to Egypt, eventually ending up in Ethiopia. There are some carvings on the Cathedral of Chartres that may refer to this. The Chapel of the Tablet at the Church of Our Lady Mary of Zion allegedly houses the original Ark of the Covenant. 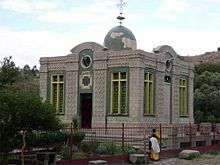 The Ethiopian Orthodox Church in Axum, Ethiopia, claims to still possess the Ark of the Covenant. Local tradition maintains that it was brought to Ethiopia by Menelik I following a visit to his father King Solomon. Although it was once paraded before the town once each year, it is now kept under constant guard in a "treasury" near the Church of Our Lady Mary of Zion, and only the head priest of the church is allowed to view it. Most Western historians are skeptical of this claim. Dr. Bernard Leeman, in his 2005 book, Queen of Sheba and Biblical Scholarship, accepts the Ethiopian traditions. He argues that the Ge'ez narrative of the Sheba-Menelik Cycle of the Kebra Nagast supports the case that ancient Judah was in west Arabia—not Palestine—and that Menelik's escape with the Ark follows landmarks and place names in Asir, Yemen, and Eritrea. Secondly Leeman draws attention to the Ark culture of Arabia (detailed in Munro-Hay and Grierson's works), the "Hebrewisms" in the Ancient West Arabian language, the word for Ark in Ge'ez (which is taken from pre-Babylonian captivity Hebrew), inscriptions in Sabaean near Mekele that speak of Hebrew residents there (c. 800 B.C.E.) ruled by three queens of Sheba, and the continued presence in the region of a Hebraic remnant group, the Ibro (or Yibir) of northern Somalia. a desolate valley under a hill - on its east side, forty stones deep. Today, it is believed by some that this refers to the Tomb of Tutankhamun (east side of the Valley of Kings, 40 stones deep). Some believe that what was found there are the described treasures, including the Mishkan and the Ark of the Covenant. Within modern Judaism, all synagogues are constructed in such a way that the most holy spot is the "Holy Ark" in the sanctuary. The place where the Torah scrolls or Sifre Tora are stored is known as the "Holy Ark" or Aron Qodesh. It is usually built along the wall of the synagogue closest in direction to Jerusalem. This spot is considered to be a miniature embodiment of the original Tabernacle found in the Temple in Jerusalem. During Jewish services in synagogues, the worshipers face in the direction of the Holy Ark, the symbol of the Holy of Holies, which contains the holy Torah scrolls belonging to every Jewish congregation. When the Holy Ark is opened so that the Sefer Torah may be taken out for Torah reading, all worshippers (except the elderly or ill) usually rise as a mark of respect for its holiness and importance. 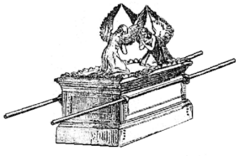 References to the Ark of the Covenant have appeared in Western popular culture, especially cinema. For example, the highly popular 1981 adventure film, Raiders of the Lost Ark suggested that Adolf Hitler, deeply interested in supernatural power and the occult, wanted to acquire the Ark in order to rule the world. The Ark's location in the movie is Tanis, Egypt. Intrepid archaeologist Indiana Jones opposes the Nazis and succeeds in keeping it from them. The Ark is shown to be extremely powerful, and dangerous to those who do not understand it. Jones wants to study the Ark, but it is last seen being boxed up and stored in a vast U.S. Government warehouse—presumably never to be seen again. The alleged secret location of the Ark of the Covenant has also been the topic of several fantasy and fiction novels. ↑ "Ark of the Covenant". Jewish Encyclopedia. ↑ Mock, Robert, "The Hiding of the Ark". ↑ Robins, Gerard, "Vendyl Jones and the Ark of the Covenant". [Original: Jewish Herald Voice Newspaper, Houston, TX. May 2000.] (mirror site). Fisher, Milton C. 1995. “The Ark of the Covenant: Alive and Well in Ethiopia?” Bible and Spade 8(3), pp. 65-72. Hertz J.H. 1936. The Pentateuch and Haftoras: Deuteronomy. Oxford University Press. Ritmeyer, L. 1996. "The Ark of the Covenant: Where it Stood in Solomon's Temple." Biblical Archaeology Review 22 (1): 46-55, 70-73. All links retrieved April 13, 2016. Ark of the Covenant. The Catholic Encyclopedia. JAH, The Ark of The Covenant in Ireland. JAH's Sociology Lecture given at Maynooth University in Ireland. Kaulins, Andis, Ark of the Covenant. Israel National News Kabbalist Blesses Jones: Now´s the Time to Find Holy Lost Ark. May 2005 (Iyar 5765). The Ark of the Covenant. Old Testament - Exodus, The Brick Testament. Shyovitz, David, The Lost Ark of the Covenant. Jewish Virtual Library. Ark Easton's Bible Dictionary, 1897. History of "Ark of the Covenant"
This page was last modified on 13 April 2016, at 14:59.